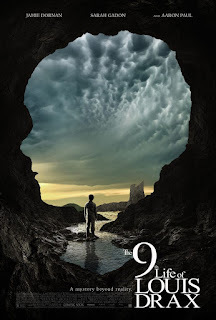 Louis, the nine-year-old protagonist of THE 9th LIFE OF LOUIS DRAX, introduces himself as “the amazing accident-prone boy.” In his short life, he's been bitten by spiders, hit in his crib by a falling chandelier, electrocuted by a wall outlet, suffered food poisoning and meningitis. Even his birth was violent, claims Louis, who describes a brutal Caesarean section that nearly killed him and his mother. His pretty, doting mom, Natalie (Sarah Gadon) tells Louis he's “an angel,” and he believes himself to be her protector. On his ninth birthday, Louis “dies” again, falling backwards off a cliff and into frigid water while on a picnic with his estranged parents. Louis (Aiden Longworth) narrates, as he does in the Liz Jensen novel on which the film is based. He tells his story from the depths of a coma as he lies in the hospital under the care of neurologist Allen Pascal (Jamie Dornan), a pediatric coma specialist. When it emerges (not a spoiler) that Louis did not fall but was pushed, his father, Peter (Aaron Paul), now missing, is blamed. A romance develops between the worried, fragile Natalie and the earnest, bearded Dr. Pascal, which leads to the doctor receiving threatening, childishly scawled letters. Dr. Perez receives similar threats. Were they written by Louis' dad, whose whereabouts are unknown? Did comatose Louis somehow write them? Why does Natalie behave so strangely? The film veers into fantasy by portraying the netherworld of Louis' coma state, in which he communes with a slimy creature with a deep, distorted voice. Is it the ghost of Louis' father, lost to the sea? The doctors Pascal and Perez try to unravel the mysteries of the Drax family. Pascal's own history of sleepwalking — about which he's written a book and delivers a TED talk — converges, somewhat confusingly, with Louis' coma state. Stories written from the perspective of a child are almost always appealing. Jensen has said that her goal was to write in the “playground idiolect” of a 9-year-old boy. I have read a portion of Jensen's book — thanks, Amazon Kindle free samples! — and I think some of its qualities were lost in translation. The novel is set in France, with French characters (Louis' mother is “maman”), and Louis' naïve, unreliable narration draws you in. The film, by contrast, has the cold, bluish-metallic look and mood that is standard for sci-fi thrillers Much of the writing sounds clunky, even though Jensen co-wrote the script. Young Longworth has a perfect tousled look for Louis, and Platt enlivens the proceedings as the skeptical shrink who spars with him, but other performances are surprisingly wooden, particularly Dornan as the coma doc. The movie delivers its shocks and surprises judiciously, but the solutions to the mysteries are either predictable or baffling. 2 1/2 out of 4 stars.